There are many different ways for ISPs to manage MPLS devices like routers and firewalls that are deployed to customer sites. This quirk explores one such solution and looks at a scenario where a misconfiguration results in VRF route leaking between customers. When an ISP deploys Customer Edge (CE) devices to customers sites they might, and often do, want to maintain management. For customers with a simple public internet connection this is usually straight forward – the device is reachable over the internet and an ACL or similar policy will be configured, allowing access from only a list of approved ISP IP addresses (for extra security VPNs could be used). However when Peer-to-Peer L3VPN MPLS is used, it is more complicated. The customer network is not directly accessible from the internet without going through some kind of a breakout site. The ISP will either need a link into their customers MPLS network or must configure access through the breakout. This can become complicated as the number of customers, and the number of sites per customer, increases. This is available for download as a GNS3 lab from here. It includes the solution to the quirk as detailed below. The ISPs ASN is 500. The two customer have ASNs 100 and 200 (depending on the setup these would typically be private ASNs, but they have been shown here as 100 and 200 for simplicity). A management router (MGMT) in ASN 64512 has access to the PE-CE WAN ranges for all of the customers, all of which come from the supernet 172.30.0.0/16. A special subnet within this range, 172.30.254.0/24, is reserved for the Management network itself. The MGMT router, or MPLS jump box as it may also be called, is connected to this range – as would any other devices requiring access to the MPLS customers devices (backup or monitoring systems for instance… not shown). The basic idea is that each customer VRF exports their PE-CE WAN ranges with an RT of 500:501. The MGMT VRF then imports this RT. Along side this, the MGMT VRF will exports its own routes (from the 172.30.254.0/24 supernet) with an RT of 500:500. All of the customer VRFs import 500:500. Customer WAN ranges will all be from the 172.30.0.0/16 and must not overlap between customers. WAN ranges and site subnets are not, at any point, leaked between customer VRFs. Note that the export map used on customer VRFs makes a point to exclude the routes that the Management supernet (172.30.254.0/24). This is done on the off chance that the range exists within the customers VRF table. This results in the WAN ranges for customers being tagged with the 500:501 RT but not the LAN ranges. 192.168.50.0/24, above, is a one of the LAN ranges and does not have the 500:501 RT. Also, note that the routing table for Customer 2 (vrf CUST_2) cannot see the 172.30.1.0/30 WAN range for Customer 1 (vrf CUST_1). NB. I’m not advocating using telnet in such an environment. Use SSH as a minimum when you can. 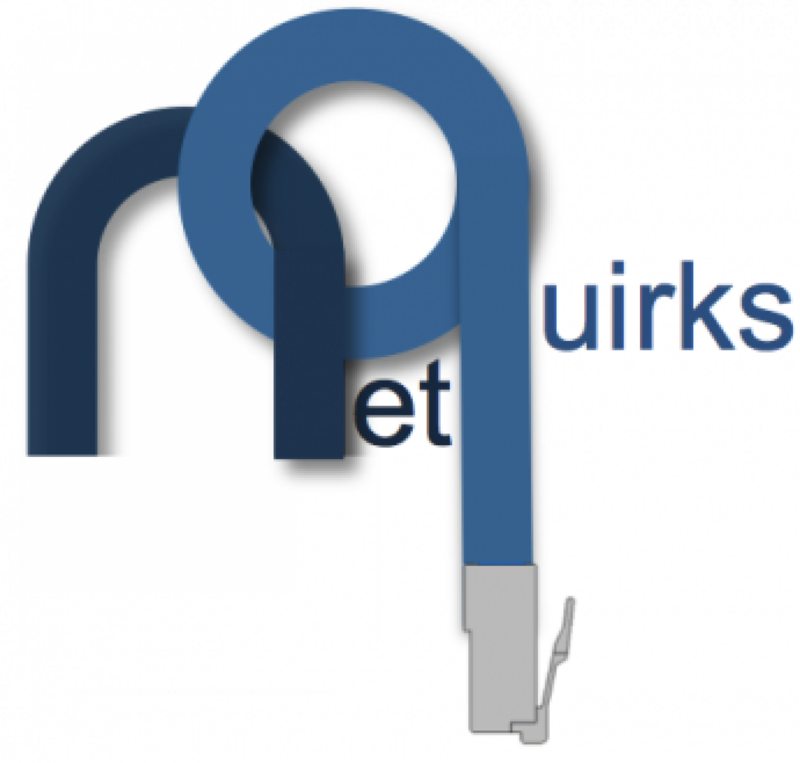 The quirk comes in when a simple misconfiguration introduces route leaking between customer VRFs. Consider an engineer accidentally configuring a VRF that exports all its vpnv4 prefixes with RT 500:500 (rather than only exporting its PE-CE WAN routes with RT500:501 as described above). The mistake is easy enough to make and will cause routes from the newly configured VRF to be imported by all other customer VRFs. This will have a severe impact for any customers with the same route within their VRF. 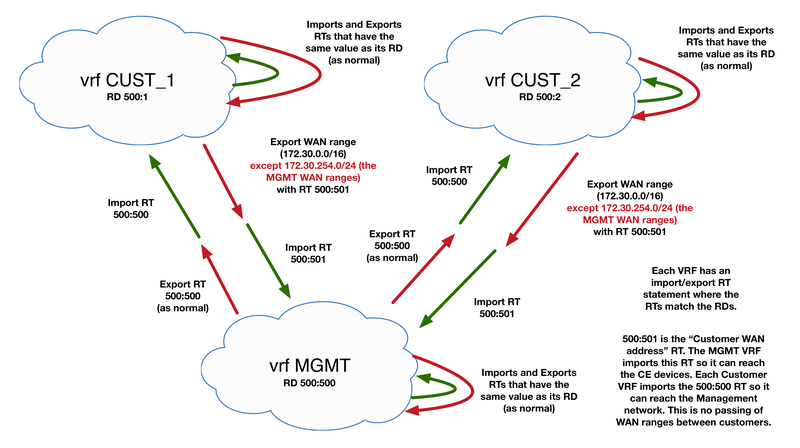 VRF CUST_1 will export its routes (including 192.168.50.0/24 from Customer 1 Site 1 – CE1-1) and the VRF CUST_2 will import these routes due to the RT of 500:500. Looking at the BGP and routing table for the CUST_2 VRF shows that the next hop for 192.68.50.0/24 is now the CE1-1 router. There are now two possible paths to reach 192.168.50.0/24. One imported from the VRF for CUST_1 and one from its own (coming from CE1-2). The path via AS 100 is being preferred due to the lower IGP metric. Note the 500:500 RT in this path. Once this is done CE2-2 cannot reach its 192.168.50/24 subnet on CE1-2. Granted, this issue is caused by a mistake, but the difference between the correct and incorrect commands is minimal. An engineer under pressure or working quickly could potentially disrupt a massive MPLS infrastructure resulting in outages for multiple customers. 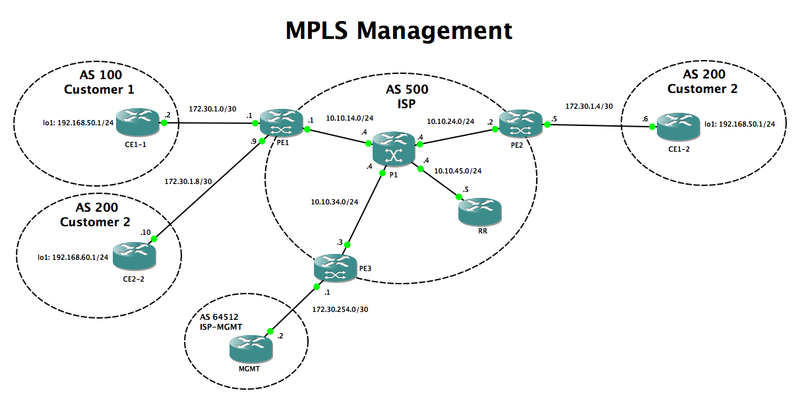 As mentioned at the beginning of this blog, there are multiple ways to manage an MPLS network. There is no restriction on the WAN addresses for each customer. They can be any WAN range at all and can overlap between customers. The same IP address can be used for each VRFs loopback (as long as it doesn’t clash with any existing IPs already in the customers VRF). The command to log on is more complex and requires the users to know the VRFs exact name rather than just the router IP. Migrating to this solution, from the aforementioned RT import/export solution, would be a cumbersome and long process. Centralised MPLS backups could be complicated if there is a not a common subnet (like 172.30.254.0/24) reachable by all CE devices. If a route has the RT 500:500 and is from the management range (172.30.254.0/24) allow it. If any other route has the RT 500:500, deny it. Allow the import of all other routes. 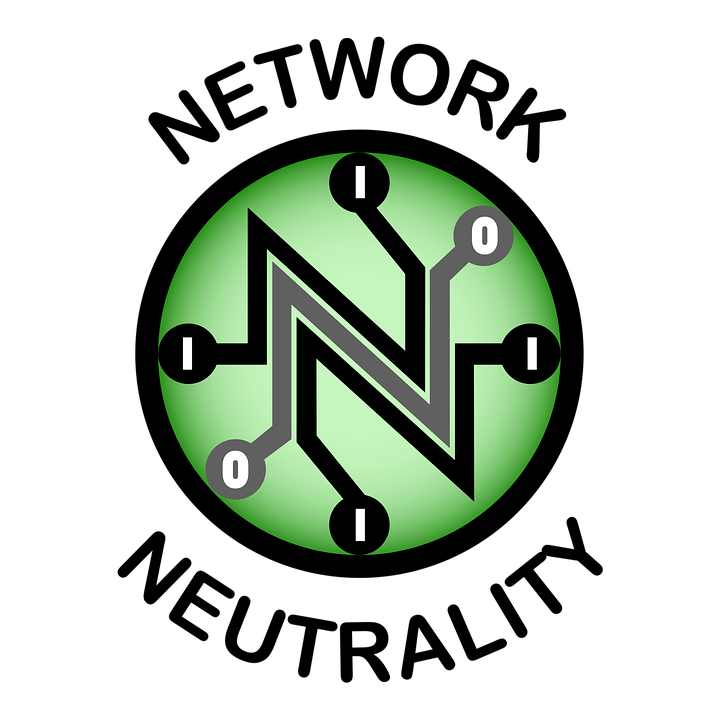 Essentially, rather than just importing 500:500, this route-map checks to make sure that a vpnv4 prefix comes from the management range of 172.30.254.0/24. The biggest issue in this scenario was the deployment of this route-map to all VRFs on all PEs. But with a little bit of scripting (I won’t go into the details here), this was far more plausible than the option of deploying a multi-VRF jump router. NB. This is a good example of and/or operation in a route map. If the types differ (in this case a prefix list and an extcommunity list) the operation is treated as a conjunction (AND) operation. If the types are the same it is a disjunction (OR) operation. This will prevent the issue from occurring as it will stop the import of any vpnv4 prefix that has an RT of 500:500 unless it is from the management range. Just for good measure, and to double check that our route-map is making a difference, let’s see what happens if we remove the import map from the CUST_2 VRF. This quirk shows just one way to successfully configure MPLS management and protect against misconfiguration. Give me a shout if anything was unclear or if you have any thoughts. As mentioned earlier, the GNS3 lab is available for download so have a tinker and see what you think.